I’m at the airport again. I think I am now officially on a first name basis with many airport security people around the country. They have my x-ray on hand to refer to, which expedites things nicely. 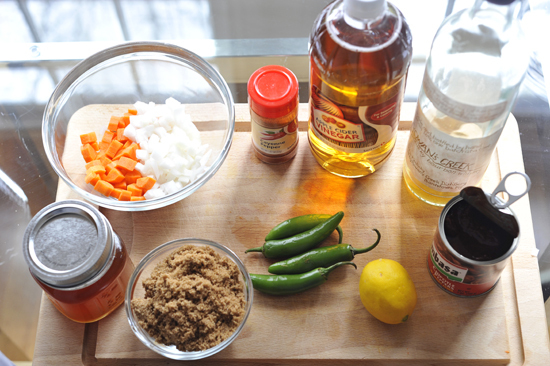 While I’m sitting here though, I thought I’d tell you about my favorite hot sauce recipe of late. It’s true I have a bit of a hot sauce obsession and have spent a time or two pushing the outer limits of my taste buds. But what is life for if not to push the outer limits of your taste buds? Okay, don’t answer that. I’ve spent time trying Tennessee Hot Chicken, and Rhoda’s Hot Tamales in Arkansas, and that special Texas BBQ/hot sauce that is undeniably… Texan. But I have a confession to make. I have ended my longtime affair with sriracha. I have a new favorite, and it’s name is Whiskey Hot Sauce. This is the cast of characters: Brown sugar, Serrano peppers (or Habanero if you’re feeling rebellious), lemon, Chipotle peppers in Adobo sauce, cider vinegar, carrots, onions, honey, cumin. Mince the Chipotle peppers and slice the lemon in half. 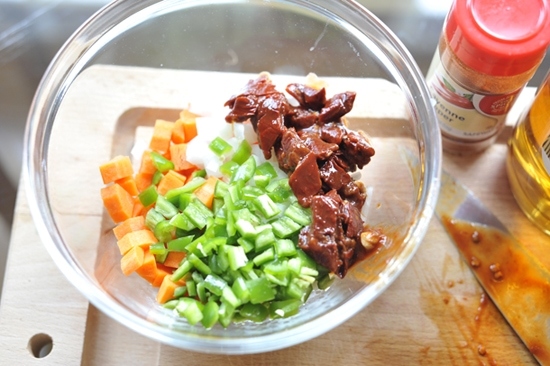 Combine it with the diced carrot, diced onion, diced peppers. Put it all in a small sauce pan with a bit of water. Simmer and add the brown sugar. Add the lemon juice. Give it a nice squeeze. Once all of the ingredients are tender, particularly the carrots, onions, and Serrano peppers, pour it carefully into a blender. 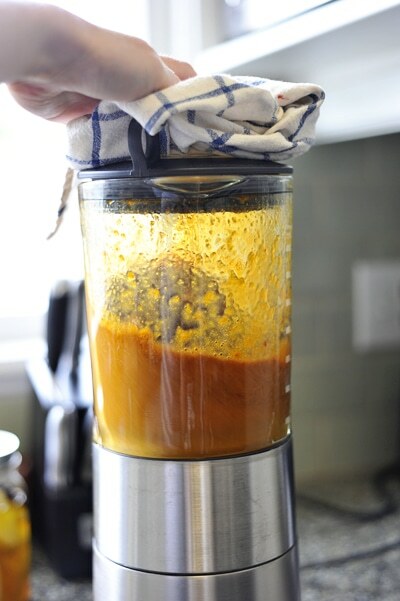 Cover it well and blend it for a few seconds until smooth. And there you have it… a tangy, spicy, whole new hot sauce. 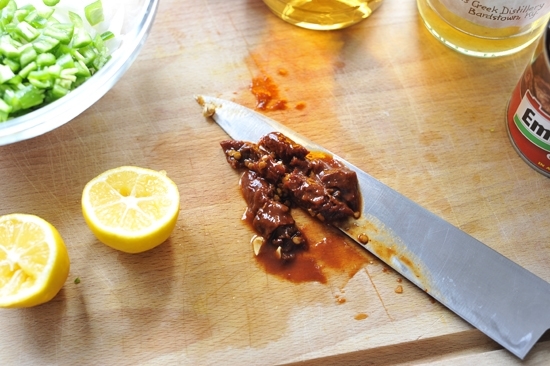 This hot sauce is “hot,” but can be adjusted to suit your taste buds. For a medium or mild version substitute jalapenos or bell peppers for part of the Serranos and chipotles, or for an even hotter version use habanero peppers in place of serranos. 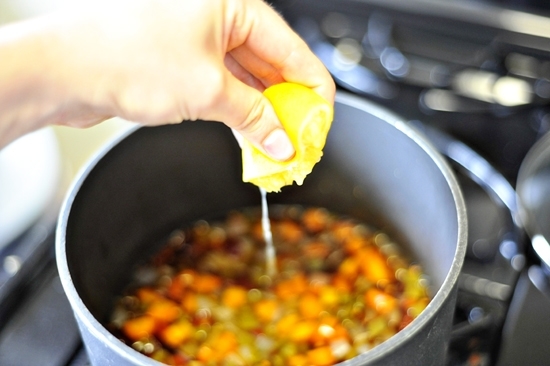 In a saucepan, heat the vinegar with 1 cup of water and add the diced peppers, Chipotle peppers, onion, and carrot. 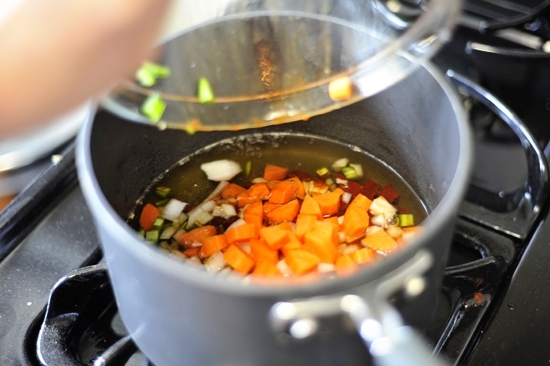 Let them simmer over low heat, covered, for 15-20 minutes to soften. 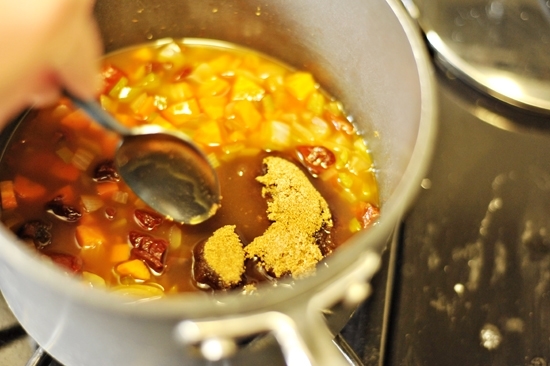 Add the remaining ingredients to the saucepan, stir and return to a simmer for 3-5 minutes. 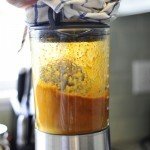 Puree in a blender or food processor, transfer to a glass jar and let cool. Store in the refrigerator for up to one year. I think that my taste buds need to be pushed to the limit with this verrrrrrrry soon! This is amazing! 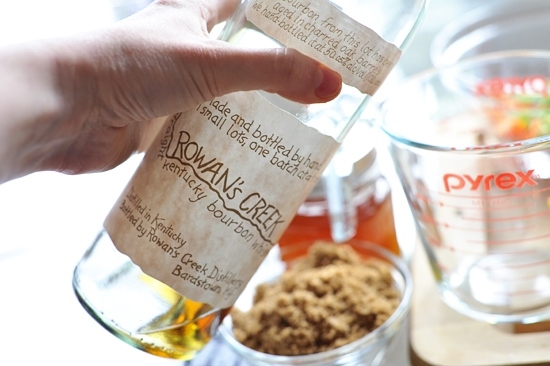 I love whiskey and must make this ASAP. This would be great with some Maker’s Mark. Oh and it would be good in the sauce as well! This looks far better than anything that might come out of a bottle. There’s something about that underlying flavor of whiskey – southern bliss. Wow Georgia, this hot sauce sounds incredible. I go ’round and ’round with my hot sauces. Mine are very traditional in yet they’re all based on what I’ve got growing in my garden. I’m curious about the effect the whiskey has on the ingredients. I was wondering if you’ve ever tried tequila in this. I’ve never tried tequila but I bet that would be worth a try for sure. Good idea Mark! If I ever get out of this damn hospital I’m gonna have to try this, especially as I have a brand new blender/FP just waiting to be used for the first time! I hope you get out of the hospital soon too and whip up a batch! Made this the other day, because I had to see what could possibly distract a fellow rooster. It is indeed incredible. I smothered an extra-sharp-cheeseburger with this sauce, cilantro, and onions. Great recipe! poor honey got cut from the final show? i’m guessing it’s a mistake? 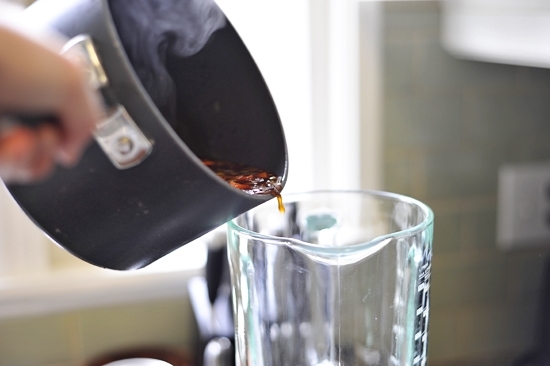 You could use honey instead of the brown sugar or molasses in there! I tried this recipe and it was amazingly good with lots of flavor and a kick. I wouldn’t use Jameson’s, Bushmills or any good drinking whiskey, but I would like to try it with the Tezpur (a.k.a. Bhut Jolokia pepper) and a twist of light brown sugar with cooked Chana (garbanzos). Found this recipe via, what else, Pinterest. Just made it for the first time and it is fantastic. This has to be in my fridge at all times. Thanks! yum. I’ve been threatening to infuse some bourbons with different things but keep putting it off. I’m thinking some Knob Creek infused with Mesquite & pecan chips for about 6-7 months to try in the hot sauce recipe. Ok I found this recipe as I was looking for a hot sauce recipe to make for my uncle as a gift as he loves hot sauce and whiskey. I was a little wary because the ingredients were unconventional (carrots in hot sauce? what?) But oh my gosh. This is seriously super delicious. I used jalepeno peppers instead of Serrano chilis as that’s what my farmers market had and Jack Daniels for whiskey. I’m so glad this made more than the mason jar I was going to give him so that I had a little leftover and I will be making another back once I get back to the farmers market! Thank you sooooo much for this delicious recipe!